Monika Weiss is a transdisciplinary artist whose multifaceted works include drawing, performing, video, sound compositions, photography, and objects. In the broadest sense, the artist’s intermedia work, executed in either private or public spaces, addresses official and unofficial histories, time, memory, and the body. Phlegethon-Milczenie (2005), Leukos (2005), Drawing Lethe (2006), and Sustenazo (Lament II) (2010-2012), discussed in this essay, are constructed as nonlinear narratives in which the existential expression of lament or lamentation is central to the visual, sensorial, and physical discourse of each work. Music is a primary language for the artist who listened daily to the piano as a child and then studied at the Warsaw School of Music, where silence and listening were an obligatory part of her training. And, as soon noted, silence, which is also a language, became a core element in her performative process. Weiss composes all the sound compositions in her work. Her body, a vehicle for expression and (silent) narration, stands for existence: its markings, absence—both are part of life. In an attempt to impart a sense of the complexity of Weiss’s thinking, performance, and practice, I will consider the various layers of her “unique fusion of media”  wherein memory, language, recorded sound, the moving image, the body, time, and contingency are embedded. In 2004, the Intergalerie Potsdam in Potsdam, Germany invited Weiss to propose an exhibition that would open in 2005. Phlegethon-Milczenie was an installation of rare German books containing literature, philosophy, and music, a performance by the artist on those books, a video projection of the installation, and a multi-channeled sound composition  . Phlegethon, the first word in the compound title, means River of Fire in Greek mythology, and Milczenie, the second word, is Polish and means “silence” or “an inability to speak.” The audience entered the exhibition in the first gallery, Phlegethon, where Weiss’s sound composition was projected together with a video projection of her performing on the octagonal arrangement of open books in the second gallery, Milczenie. 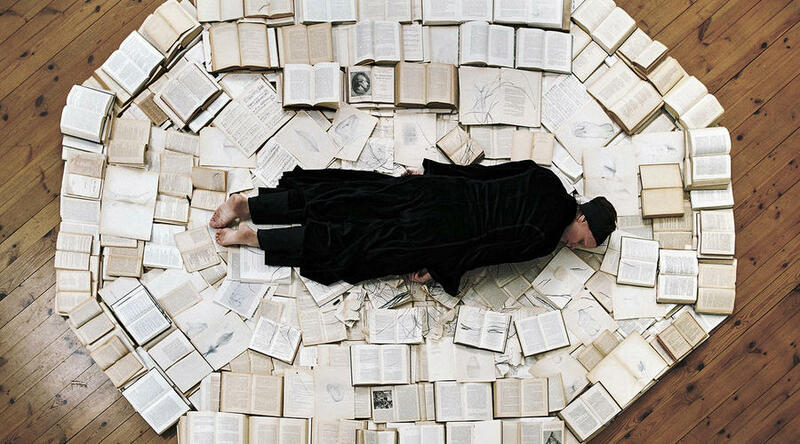 In the Milczenie performance, which the artist repeated several times during the duration of the exhibition, she moved slowly and silently across the books with her eyes closed, in a meditative state, making marks with graphite and charcoal sticks around her body. The books, by mostly German writers, philosophers, and composers, were either revered or destroyed by the Nazis. Their destruction depended on whether the regime deemed the authors degenerate or racially stained, and therefore not worthy contributors to high Germanic culture. The three-part composition of Phlegethon-Milczenie is analogous to a classical musical composition, particularly in the historical period of Romanticism. 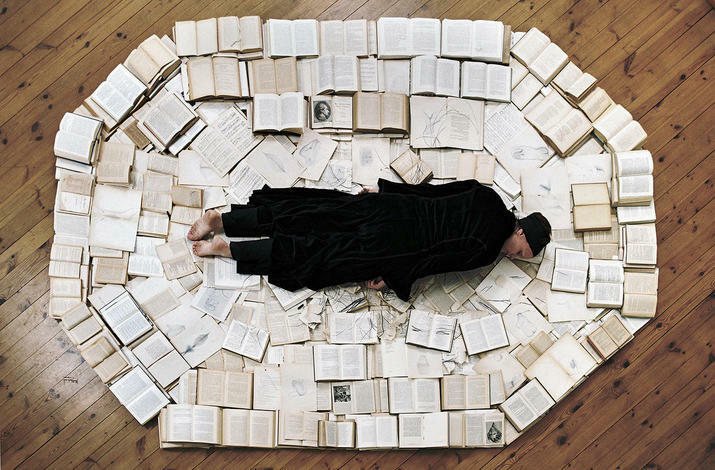 The first part shows the overhead view of the artist lying on the octagonal sculpture of the books drawing around her body accompanied by the sounds and some of the imagery of the burning book; the second part continues with the sounds of burning and some of the imagery of the burning book and also introduces the voices of the German speakers reading passages from Paul Celan and Thomas Mann, as well as the artist’s own voice in Polish and English; the third part shows closely filmed views of the burning book, Doctor Faustus, and accompanied by twelve irregularly overlaid and digitally altered tracks of the soprano’s voice singing a capella selected passages from Salve Regina by Giovanni Battista Pergolesi, and The Oratorio by Joseph Haydn. During the two weeks following the opening, the artist selected fragments of raw footage from the camera recordings and edited them into the first two parts of the video. Weiss then added the third part, the scene of Thomas Mann’s book, burning, which she had completed in New York. The final 18-minute video, determined by the duration of the sound composition, was subsequently projected throughout the exhibition in the Phlegethon room, with the exception of the instances when the artist returned to perform on the books. At those times the projection would again show the live view from the Milczenie room. Weiss’s comments are notable in this regard: “There is a counterpoint quality of sound and image in this work in which I combined images of my body with the sounds of pages burning and images of fire with the sound of voices. I explore the important relationship between drawing and sound/music, focusing on the time-based and rhythmic qualities of drawing and the spatial and sculptural properties of music/sound. Both relate to the language of the body.”  These tropes elicit a play of time, memory, and a historical archive. 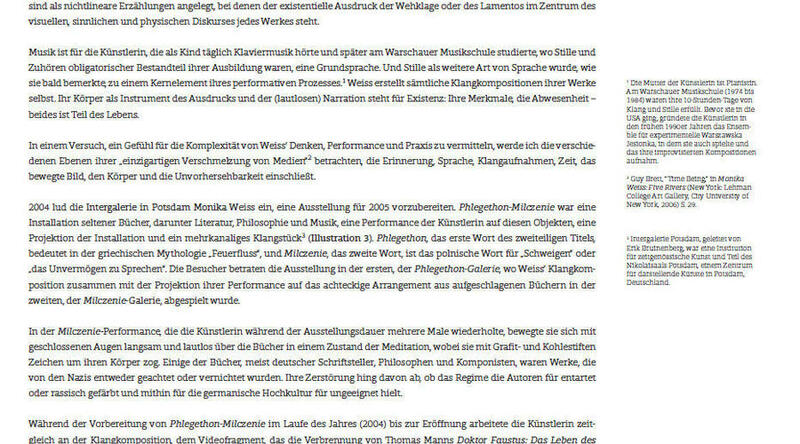 Phlegethon-Milczenie was included in Weiss’s first retrospective, Monika Weiss: Five Rivers (2005-2006), at Lehman College Art Gallery (CUNY) Bronx, New York. The focus here, however, is on Leukos, an ancient Greek word meaning white, or light, brightness. The artist did the outdoor performance on sheets of white canvas sewn together and placed in the middle of the college campus. In this public performance, Weiss lay on an enormous canvas for three days, in different weather conditions, and drew marks around her body. In silence with her eyes closed, she slowly drew traces of herself moving across the white ground, leaving a record of her temporal presence. During the duration of the performative action, the curatorial staff invited people passing by to join the artist in silence and make their marks alongside of hers. In focusing on the moment and embracing the opportunity for chance, the participants, some still and others in movement, left traces of their bodies. In order to film that performance, Weiss had a camera installed on the rooftop of a building that captured the changing canvas as it gradually became darker due to a combination of the markings made by many participants and the rain that smeared the marks. Later, the sound of the wind was recorded as part of the sound composition. At the end of the performance, the canvas was moved into the main gallery, where its presence, according to the artist, felt like a shroud. Sustenazo (Lament II), presented at the Museo de la Memoria y Los Derechos Humanos in Santiago, Chile, was one of three videos presented as part a solo exhibition at the Centrum Sztuki Współczesnej Zamek Ujazdowski in Warsaw in 2010. In Santiago the exhibition included an installation of books, many with the artist’s drawings, together with medical instruments. Similar to all of Weiss’s work, she directed, recorded, composed, and choreographed this work . The multiple meanings of Sustenazo (Lament II) are evoked through a sequence of imagery featuring the torso of a woman, a dancer, moving slowly backward and forward in opposite directions, embodying in her gestures the expression of lament. Against this imagery are those of old maps of Europe, medical instruments used before and during World War II, a medical photograph of a woman’s chest, and a white-gloved hand moving gently over it (Illustration 16). The visual narrative is dramatically enhanced by the artist’s musical composition, which includes recitations and deconstructions of literary texts. The visual narration excludes any specific references to the patients and medical staff of the Ujazdowski Hospital, who were forced to evacuate overnight by the German Army (Wehrmacht) onto the streets of burning Warsaw, resulting in the deaths of 1,800 patients. The artist’s mother Gabriela Weiss is a pianist. At the School of Music (1974 to 1984), her ten-hour days were filled with both sounds and silence. In the early 1990s before coming to the U.S., the artist co-founded and played in the experimental music ensemble Warszawska Jesionka, which made recordings of their improvised compositions. Guy Brett, “Time Being,” in Monika Weiss: Five Rivers (New York: Lehman College Art Gallery, City University of New York, 2006), p. 29. Intergalerie Potsdam was a contemporary art institution directed by Erik Bruinenberg, and was part of Nicolaisaal Potsdam, a center for performing arts located in Potsdam, Germany. Paul Celan was born into a German-speaking Jewish family whose parents were victims of the Holocaust. His experience of the Holocaust is a defining force in his poetry together with his use of a repetitive, condensed minimal use of language. For further elaboration on the artist’s methodological approach to video and sound compositions, see Monika Weiss in “Julia P. Herzberg Interviews Monika Weiss,” in Poza: On the Polishness of Polish Contemporary Art (Hartford, Connecticut: Real Art Ways, 2007), pp. 130, 131. Following the Potsdam video-performance-installation, the project was transported to the Kunsthaus Dresden (2006), where it was shown in the group exhibition Von Der Abwesenheit Des Lagers. In 2007, the installation was part of the group exhibition Forms of Classification: Alternative Knowledge and Contemporary Art at the Cisneros Fontanals Art Foundation (CIFO). The entire work was acquired by CIFO for its collection. Monika Weiss in “Julia P. Herzberg Interviews Monika Weiss,” in Poza, pp. 131, 132. In 2006, Weiss presented the project at the Remy Toledo Gallery, New York. From the thirty-five hours of video footage at Lehman, the artist created a film, a dual projection with a sound composition consisting of laments, sung by the same male soprano vocalist who sang in her Phlegethon-Milczenie composition, and included sounds from the Lehman College campus. The laments were a combination of historical classical compositions together with Weiss’s own melodies, all overlapping, montaged, some reversed, creating an ocean of sound. Weiss and her assistants sewed sheets of canvas together, which covered the floor, leaving the area around the palm trees bare. The overall size of the canvas was approximately 3000 ft². Before the opening of this public project, the artist composed the main sound composition over a period of several months. It was created from her various sound recordings and many tracks that incorporated collaged fragments of musical phrases sung by her opera vocalist and the whispering voices. The predominant component of the composition were the sounds recorded on site by the artist as she was suspended from the glass ceiling of the Winter Garden with her sound recording equipment. Throughout the duration of the project the sound composition of 120 minutes was played on a continuous loop. In addition, there was a delicate live sound gathered by the microphones and mixed into the main sound coming through the speakers that added contingency to the overall sound environment. Etymologically, the word lament derives from Greek leros – “nonsense.” Webster’s New Collegiate Dictionary (C. & G. Merriam Company: Springfield, Mass., 1977), p. 645. 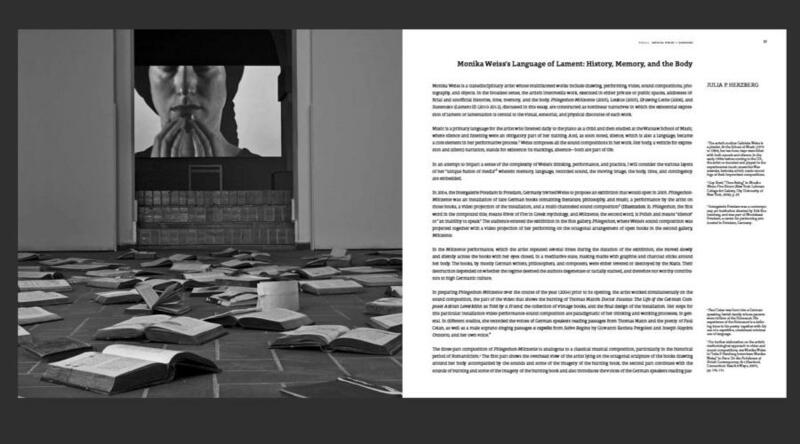 Ricardo Brodsky and María José Bunster, “Introduction,” in Monika Weiss: Sustenazo (Lament II), general editor Julia P. Herzberg (Santiago, Chile: Museo de la Memoria y Los Derechos Humanos, 2012), p. 3. This essay was published in "RECALL: Roland Schefferski & Monika Weiss"